Taħżiż, the empowerment programme which focuses on creative writing, has entered its second year. The second residential seminar will be held between the 25th and the 27th of July, during which the participants will have the opportunity to live together for three days in an environment that encourages writing. They will be trained in different techniques through different writing exercises whilst the individual meetings with the coordinators will help them ruminate their writing for the better. Group work and group meetings will help the participants to step into the critics’ shoes and learn from their friends’ writings as well. This year’s participants are: Beverly Agius, Dorianne Bonello, Sylvana Bugeja, Francesco Grech, Stefan Magri, Joseph Paul Muscat and Matthew Schembri. For more information regarding the participants and the seminar progress, one can visit blog tahziz.wordpress.com and the Facebook page facebook.com/tahziz. 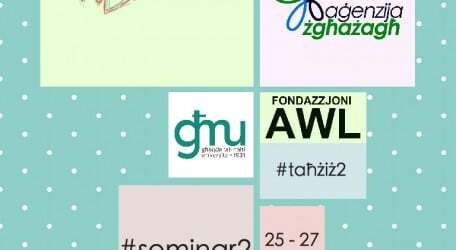 Taħżiż is being organized by Aġenzija Żgħażagħ in coordination with Għaqda tal-Malti – Università and Fondazzjoni AWL .